Children at St. Jerome Parish in Northeast Philadelphia enjoy a healthy lunch June 20 as part of the Summer Meals program of archdiocesan Nutritional Development Services. Children at St. Jerome School in Northeast Philadelphia celebrated the annual Blessing of the Summer event along with volunteers to mark the beginning of the Summer Meals program of archdiocesan Nutritional Development Services (NDS) on June 20. Msgr. Daniel Sullivan led the blessing to kick off the Summer Meals program, which is funded by the U.S. Department of Agriculture and sponsored locally by the Philadelphia Department of Parks, the Department of Housing and NDS, along with many other local partners. For over 30 years, the NDS program has distributed free breakfasts, lunches and snacks to thousands of children in Philadelphia and the surrounding suburbs. This year the program runs from June 18-Aug. 24 at different sites throughout such areas as Philadelphia, Chestnut Hill, Norristown and Upper Darby. The food items follow federal nutrition guidelines for children, providing them with healthy meals and snacks. Lunches are designed to offer each child one-third of the daily recommended value of nutrition, and generally consist of a sandwich, fruit, vegetables and milk. Msgr. 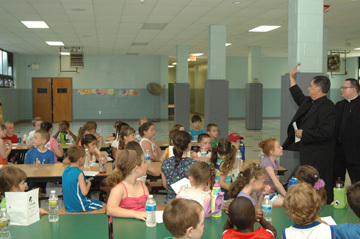 Daniel Sullivan blesses children and staff in the annual Blessing of Summer event for the NDS summer Meals program June 20 at St. Jerome School. 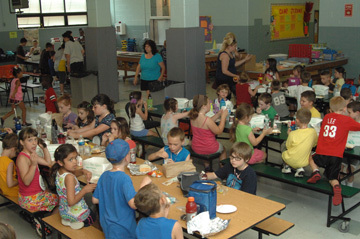 Many summer food service programs are located in non-traditional settings, such as WIC offices, libraries, community rooms for apartments and townhouses, family social service centers, convents, environmental centers, Welfare to Work programs, colleges, or theaters, according to the NDS web site. “Some programs are started by community leaders — like ladies auxiliary groups or block captains — who see children in need and take action by setting up tot lots or play areas that only provide meals,” the site read. Communities that wish to bring the Summer Meals program to children in their area can qualify an organization in their own neighborhood by calling NDS. The setting must be a non-profit program that brings 25 or more children together each day for at least one week of the summer. Once approved, the new site will have the “ready to eat” food items delivered directly by NDS members every day of the program. Because of the dedication of the workers and program leaders, NDS successfully serves approximately 20,000 meals every day at over 400 sites every summer, and the numbers keep growing. At the end of each season, the NDS board of directors brings together a focus group to go over the positives of the program and to determine any areas for improvement for the next year.